My Mini Skinny Pumpkin Pie With Graham Cracker Crust is EASY to make and a treat to eat. Today’s recipe is for the pumpkin pie lovers out there who 1) are watching what they eat and 2) don’t want to play with pie dough. Now I love me a decadent dessert, and I LOVE playing with pie dough (you have seen my Game of Thrones Deep Dish Frey Pie and Dutch Apple Galette for Two haven’t you? ), but I also appreciate a lighter recipe that’s easy to boot, so here’s a lighter pumpkin pie. In place of a traditional pie crust, I used a brown sugar graham cracker base. It’s pretty much the same one I used in my S’mores Cupcakes, so you know it’s going to be good. And instead of cutting and fussing and shaping pie dough, you just crush, mix, and spread this crust. Way easier, just as delicious. On top of the graham cracker crust, you have a lighter pumpkin pie custard. 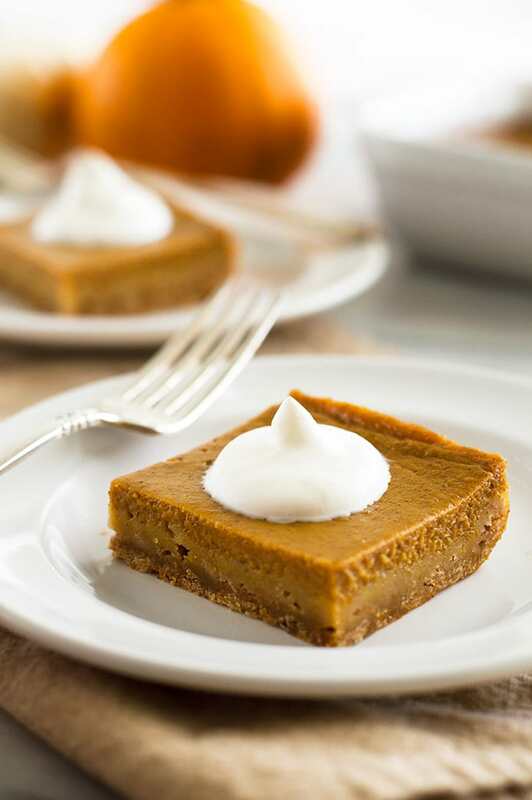 Normal pumpkin pie usually uses evaporated milk, condensed milk, or cream in the custard part of the pie, but this pie is made with low-fat milk which slashes the calories, but is still so creamy and good and everything you love about pumpkin pie. And just to keep things interesting, I added a dab of whiskey-infused whipped cream. You can use bourbon, Kahlua, whatever alcohol you like that would complement pumpkin pie. The boozy flavor isn’t overpowering. It’s just a little exciting and a lot delicious. This perfect little pie will make 4 to 6 servings depending on how you slice it and comes in at around 200 calories a serving (about 150 without whipped cream). If you are having an intimate Thanksgiving gathering or just feel like pie and don’t want to share with the world, definitely consider this one. You’ll need a 7 x 5-inch baking dish for this pie. I used a ceramic one for the photos (because it’s purdy), but I usually use Pyrex dishes* for small-batch baking since you can bake in them and then just throw on a lid for storage. The normal pumpkin pie “jiggle test” doesn’t work with this pie since the custard layer is not very deep. It will stop jiggling long before it’s actually set. To test for doneness, insert a knife into the center of the pie. When it comes out clean, your pie is ready. For convenience, if you stock pumpkin pie spice (homemade or store-bought*), you can replace the spices in the pie (not the salt) with 1 teaspoon of pre-mixed pumpkin pie spice. Preheat your oven to 375°Lightly grease a 7x5-inch baking dish. In a small bowl, whisk together graham cracker crumbs, flour, and sugar. Stir in melted butter until well-mixed. Press crumbs firmly into your baking dish with your fingers or the bottom of a small drinking glass. Bake for 10 to 12 minutes, until crust is slightly darkened and looks set. Turn the oven down to 350°. 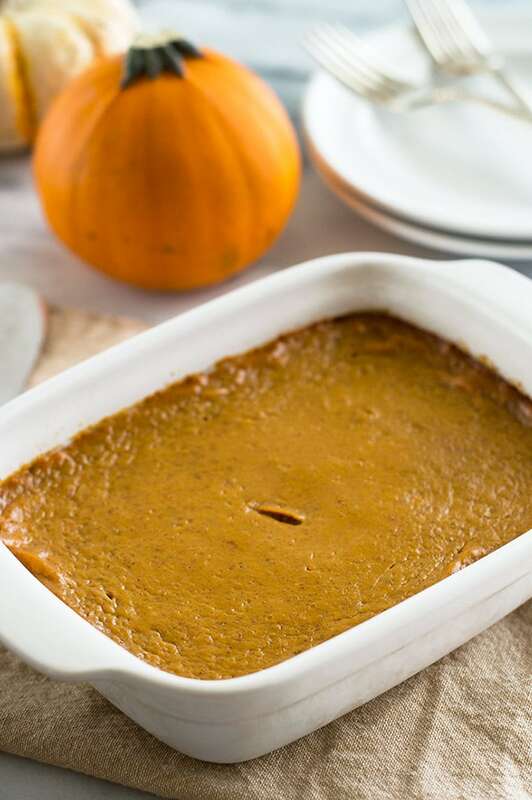 Place crust in the refrigerator while you mix your pumpkin pie ingredients. In a medium bowl, whisk together all pie ingredients until smooth. Pour mixture into the slightly cooled crust and bake for 35 to 45 minutes until a knife inserted into the center of the pie comes out clean. Cool on the counter for 20 minutes before refrigerating for at least 2 hours. Place a medium bowl and whisk in the freezer for 15 minutes. Once the bowl is chilled, remove from the freezer and combine heavy cream, sugar, and whiskey. Whisk vigorously until soft peaks form, 4 to 7 minutes (much less if using a hand-held electric mixer). Spoon over the chilled pie. 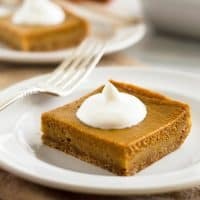 These look so rich and creamy and love how they are ‘skinny.’ Knowing that they are skinny, I’d probably eat more than one so that would totally defeat the purpose, lol 😀 All those warm fall spices must make for a wonderful dessert and I bet the kitchen smells amazing as this bakes! Pinned. Happy Monday!! What a lovely lighter dessert! Personally I think graham cracker crusts are waaaaay better than pastry, and I’m trying to eat sensibly, so I think I’ll have to give this a try…thank you! oh man.. I just can’t get enough pumpkin! Somehow I haven’t had any pumpkin pie yet this year. That will have to change! I love that this is a lighter calorie version of a Thanksgiving staple! Thanks for sharing! I agree that a boozy whipped cream is a little exciting 🙂 This recipe sounds awesome! 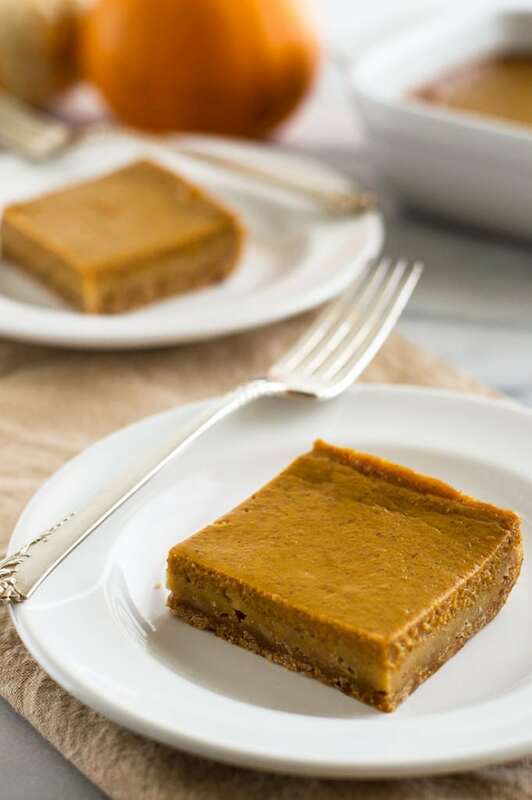 These pumpkin pie bars look amazing! Love that I can save calories without sacrificing taste! I only had an 8×8 pyrex but they still turned out so yummy! I think I will go with a different pan next time. Great if you are watching your weight. So glad you enjoyed it, Bridgett!